Disease-causing organisms can be found everywhere, including on healthy-appearing animals. In fact, you can unknowingly spread these viruses and bacteria to your pet on your hands, clothing, or shoes as well as common water and food bowls. When these exposures occur, your pet’s immune system must be prepared. Fortunately, protecting your pet against illness and disease can be as simple as vaccinating your pet according to your veterinarian’s recommendations. Vaccines are inactivated or altered live disease agents that, when introduced to your pet’s system, cause his/her immune system to produce a protective response to that specific disease. Accordingly, proper vaccination is the best way to prepare your pet’s immune system when the “real” infection strikes. This resulting protection to your pet greatly outweighs any risks, with such vaccines having saved the lives of millions of dogs and cats. Location. Some diseases are more prevalent in certain areas of the U.S.
Age. Young animals are at a higher risk from many diseases because their immune systems are not being fully activated. Likewise, older pets are more susceptible to infections and related complications because immune systems tend to weaken as the pet ages. Being Outdoors. If you pet goes outdoors, even for a few minutes, he or she may come in to contact with squirrels, mice, skunks, birds, or raccoons – or their habitats. These animals, along with other carrier cats and dogs, can shed infectious disease organisms. Unfortunately, these agents can potentially remain capable of infecting your pet for an extended period of time. Likewise, pet owners can unknowingly come in contact with these agents and carry them inside on clothing and shoes. As a result, your pet can be exposed to infectious diseases without directly contacting another animal! Proximity to Mosquitos and/or Ticks. Mosquitos and ticks are common carriers of serious diseases. Only a brief exposure is necessary for your pet to become infected. Travel. Since your pet is part of the family, traveling with him/her seems natural. Unfortunately, a single exposure can infect your travel mate. Before you travel, ask your veterinarian if your destination poses any threats to your pet. Standing Outdoor Water. Disease-causing microorganisms flourish in ponds, puddles, and other water-containing refuse. To prevent diseases such as Giardiasis (dogs and cats) or Leptospirosis (dogs), keep your pet away from these areas. Groomer, Boarding Facilities, & Pet Shows. Disease-causing agents can remain on combs, towels, cages, show rings, and other items well after the infected pet has left. In fact, some bacteria, viruses, and fungi can remain infectious for long periods of time in these environments. As a result, your pet can be exposed to numerous infectious diseases without directly contacting another animal. Hunting, Camping & Hiking. Active dogs are particularly susceptible to diseases carried by wild animals as well as those spread by ticks and mosquitos. Such diseases include Lyme Disease, Leptospirosis, and Heartworm. Missed or Forgotten Dosages. Forgetting your pet’s monthly heartworm pill can leave your dog vulnerable to deadly heartworm infection and other internal parasites. While the great majority of pets respond well to vaccines, there are some risks to vaccinating your pet. Fortunately, serious side effects are rare. When they do occur, your pet may demonstrate a low-grade fever, depression, or decreased appetite. Most are short-lived, require no treatment, and are comparable to what we experience after receiving a flu or tetanus shot. Allergic reactions, including vomiting, diarrhea, itching, breathing difficulty, swelling of the face or extremities, and hives, are rare but may occur. These signs should be reported to your veterinarian if your pet has experienced an allergic reaction to past vaccinations. Pet owners should adhere to the vaccination protocols recommended by your veterinarians at Wooster Animal Clinic. 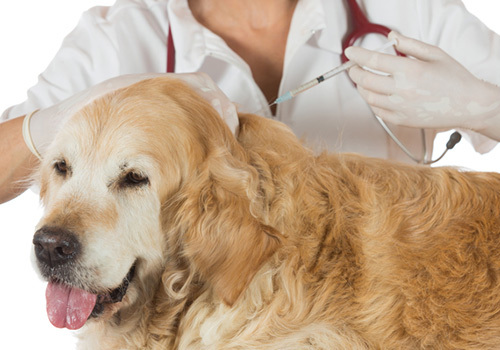 Generally, annual vaccination remains the standard for most diseases and most pets. Extended vaccination intervals may be appropriate in some situations. Your veterinarian will manage the vaccination schedule that’s right for your pet.